Clark School of Engineering faculty, alumni, students, and staff are regularly recognized for their outstanding service, research, teaching, and creativity. 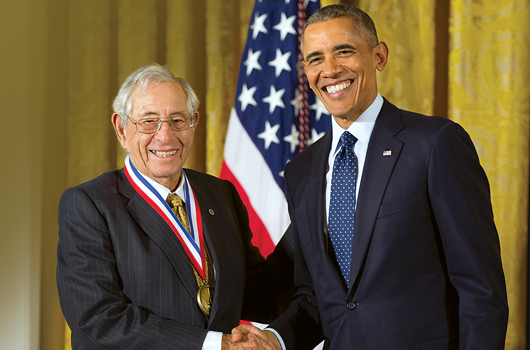 President Barack Obama awarding University of Maryland alumnus and Fischell Department of Bioengineering namesake Dr. Robert E. Fischell the National Medal of Technology and Innovation. Our Clark School faculty, staff, and alumni are regularly recognized through the school, from the university, across organizations, and by the nation for their exceptional service, research, teaching, and creativity. Dr. Christopher Davis receiving the Clark School's Poole and Kent Teaching Award for Senior Faculty. 2016 White House ceremony where President Barack Obama awarded Dr. Anya Jones a Presidential Early Career Award for Scientists and Engineers (PECASE). Members of the Innovation Hall of Fame, who may be alumni, faculty, and others closely linked with the Clark School, have made a positive impact on society by creating a working product, system or design, or by producing a comprehensive body of technical work that has advanced the understanding of the engineering profession. Dr. Hamid Jafarkhani, the 2017 IHOF inductee, honored for outstanding contributions to the development of space-time methods and algorithms for multi-antenna wireless communication systems and networks. The annual Engineering Honors & Awards Ceremony honors undergraduate students for excellence in academics, leadership, and service. Members of the Department of Aerospace Engineering's Women in Aeronautics and Astronautics (WIAA) receiving the Clark School's Women in Engineering Service Award. The Clark School, through its Top 25 Engineering Source Schools Program, makes a special effort to recognize the Maryland high schools that provide it the greatest number of students. Recognition includes the listings at the links below and letters and certificates from Clark School Dean Darryll Pines.